You might have heard of incidents from your friends of how they could manage to get a good deal at a hotel when they took a room on reaching the place itself. Unfortunately, such story tellers often skip narrating about the quality of the room and the availability of the best ones. An experienced traveler will always advice you to book hotel rooms in advance because of the convenience that comes along with it and the great discounts that one can get on locking it online from beforehand. 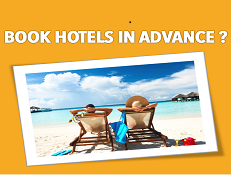 Hotels and resorts usually reserve only a certain number of rooms for giving away at discounted rates and there is a good probability that they get booked in advance and you are left with non discounted and costlier options when you book a room at the last moment. Also, the rates might increase with the reduction in the time gap of your booking and actual stay. If you are going to visit an unknown place, it is always safer to do the research on the hotels at that place and then book a room in advance only. By doing so, you will save your time by not having to roam around with your luggage in a new place. You will have the assurance and certainty that there is a place for you to reside. It becomes really difficult to find an accommodation especially during the peak seasons of visit to any travel destination. For example, it is the time for summer vacations. Hill stations like Nainital and Mussoorie will be jam packed with families trying to escape the summer heat in the famous hills. By simple Economics, you can understand that when the demand for hotel rooms is more than their supply, the prices will rise. Thus, in such a situation, it is always better to reserve your room at a prior date only if you do not want to be left without any accommodation altogether!